Eggs are awesome anytime, but hard boiled eggs can start getting boring at the office. Here’s one way to add some variety to eggs made at the office – or anyplace with a microwave. You may have to adjust the timings to your specific microwave, the dish used, and you preference for done-ness. Mr Coach like well done whites and very runny yolks. And, please cover the dish when doing this to avoid the ire of your co-workers, spouse, or any other microwave-Nazi that may be in your vicinity. In a microwave safe dish, melt the butter for 30 seconds. Separate the egg whites and add them to the dish. Season the whites with salt & pepper and microwave covered for 3 minutes. 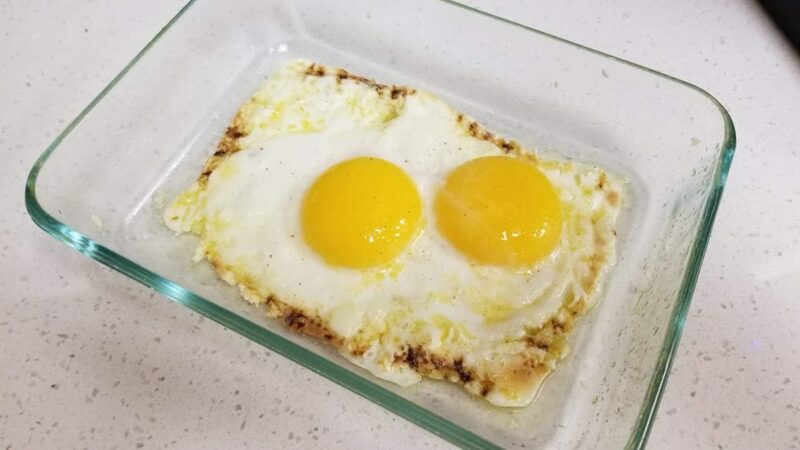 Add egg yolks over cooked whites and microwave covered for 40 seconds for warm, runny yolks and a Sunny Side Up analog.